More info on the Cinglé du Mont Ventoux here. As we didn’t arrive in Bédoin before 21:00 yesterday, we were lucky to get a bite at the Italian restaurant after we settled into our room. It was almost midnight by the time we went to bed. However, the hotel owner was not going to serve breakfast before 8:30 anyway – no exceptions, because that privilege was reserved for the Saturday, when large crowds of Belgian cyclists would occupy the Ventoux for their equivalent to our Alpe d’HuZes. All in all, I didn’t get on zee baik until just before 10:00. 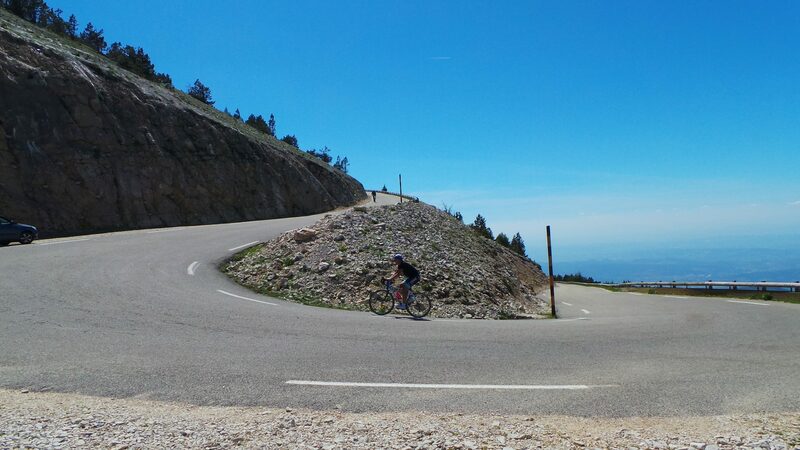 I anticipated that every climb up the Ventoux would require about two hours and with more time in between to grab a bite and rest a bit, I would be done with my three ascents of the Mont Ventoux around 19:00. It would probably have been better not to cycle between 12:30 and 15:00 (or so), but having started so late, I didn’t have a choice. This made the second climb from Malaucène the hardest of the three; it has less – next to none – shady stretches and there are some steep kilometers (from 11 to 8) that are quite hard under the blistering sun. The first 16 to 17 kilometers of the ascend from Sault are overall indeed by far the easiest, although since it was the third climb of the day, it was by no means a freebie. Anyway, I made it up that one too, the last 7 kilometers – which are the same as the Bédoin ascend – being extra hard on account of the wind reaching dangerously high speeds. Upon arrival at the near deserted summit around 8pm, we shot a picture, I quickly changed into warm(er) gear and started the descend back to Bédoin. We visited the same restaurant as yesterday again for a good ‘post Cinglé du Mont Ventoux’ dinner – I’m proud of the achievement, obviously, but the more sane thing to do, would be to plan this as a complete trip in itself, rather than as a side event. Trip: 137.3 km / 4,283 m elevation gain (Garmin).